Sydney’s iconic rainbow crossing at Taylor Square in the heart of Sydney’s LGBTIQ district is back, just in time for the 2019 Sydney Gay and Lesbian Mardi Gras! 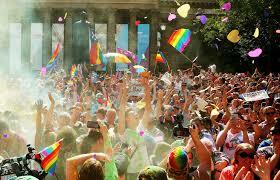 Sydney Mardi Gras is the world’s most joyous and spectacular celebration of LGBTQI pride. Sydney Mardi Gras attracts over 20,000 interstate and international visitors each year, who enjoy a diverse and exciting line-up of events. The event will commence on Feb 14th this year and run until March 3rd. The pedestrian crossing is the first in the world to be both the shape and colours of a rainbow, as it curves around the intersection of Bourke and Campbell streets. City of Sydney’s Lord Mayor Clover Moore said, “By installing this beautiful crossing as a symbol of pride in our city’s diversity, Sydney joins other cities around the world, including in Hollywood, San Francisco, Paris and most recently in Wellington, New Zealand.